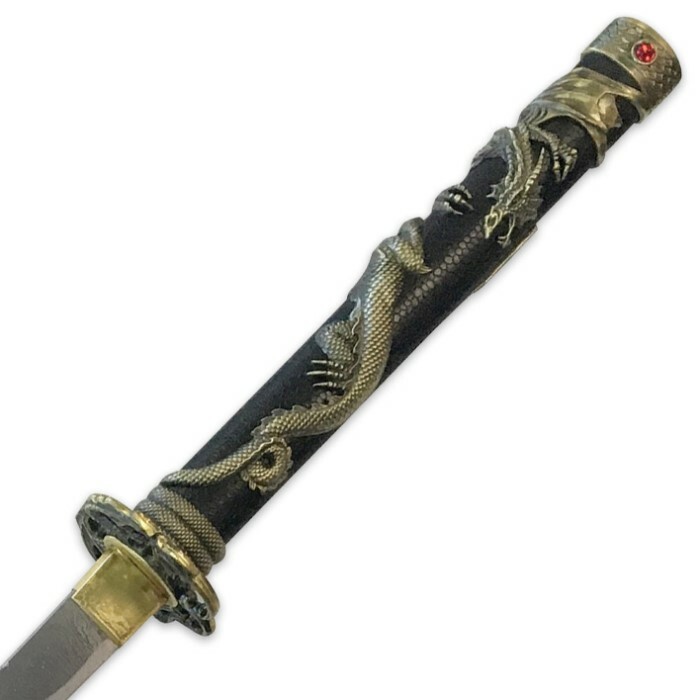 Ten Ryu Garnet Crown Dragon Katana with Red Wooden Scabbard - Antique Gold | BUDK.com - Knives & Swords At The Lowest Prices! Like the majestic golden dragon it depicts in exquisite detail, the Ten Ryu Garnet Crown Dragon Katana is strikingly beautiful, but savagely fierce. 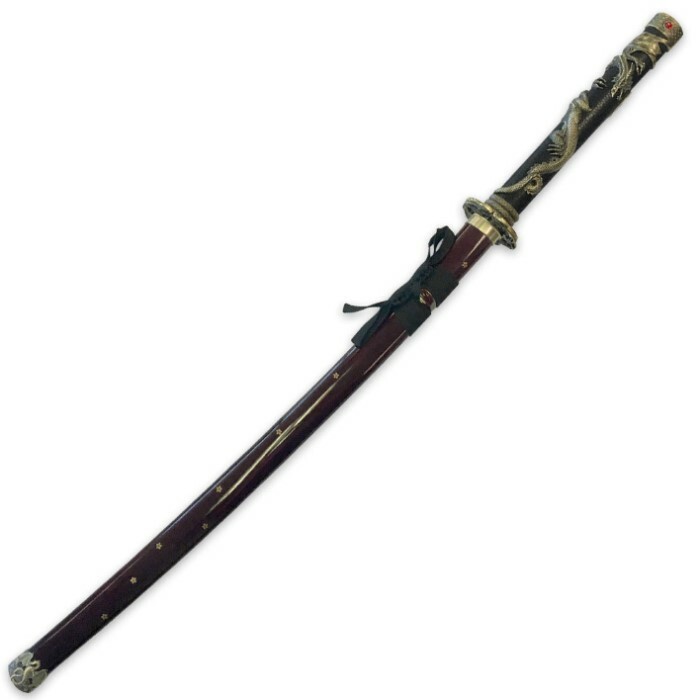 Carefully handcrafted by master swordsmiths, the 42" Garnet Crown Katana is designed with the serious sword enthusiast in mind. Its imposing 30" blade is forged from top-shelf 1045 high carbon steel that’s precisely and delicately formed, polished and honed to yield a legendarily sharp edge. 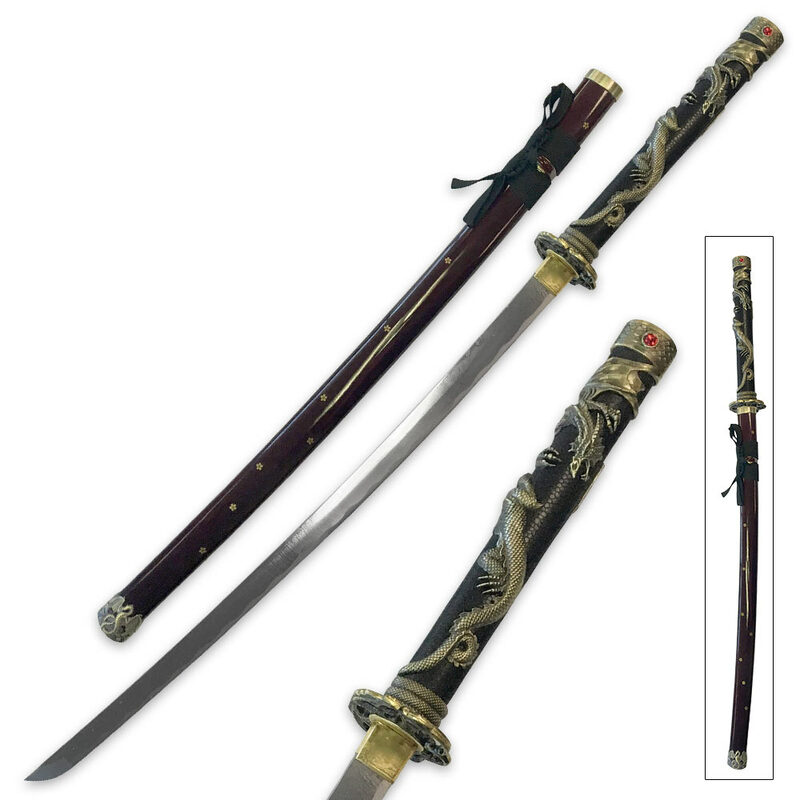 True to the mighty katana’s reputation, the Garnet Crown slices through thick rolled straw mats, bamboo and other challenging materials like a hot knife through butter. The handle is nothing short of breathtaking. Sculpted with painstaking attention to detail and rendered in dazzling raised relief, a metal alloy dragon lithely encircles the handle, his serpentine tail tightly wrapped around the base and his piercing talons gripping the faux ray skin beneath. A stunning, intricately crafted handguard forms the base of the handle, while a faux garnet-studded pommel crowns the top. Even the wooden scabbard is a sight to behold, decked out with traditional cord wrapping and polished to a sumptuous luster. Simply put, the Ten Ryu Garnet Crown Dragon Katana is magnificent, the crowned king of any fine sword collection.